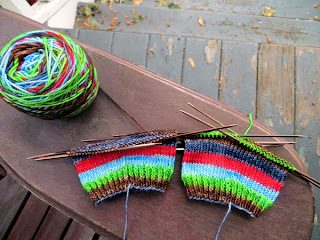 Today I thought I'd share my trick for getting the stripes to line up on two socks knit from one skein of self striping yarn. 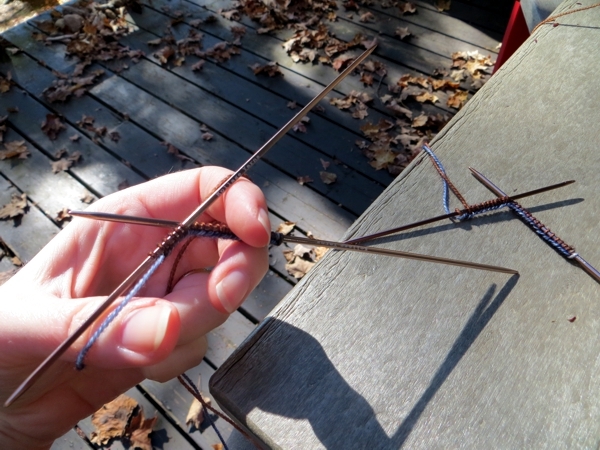 The same trick would work for gloves, or any other project that comes in pairs. After I took this picture, I realized that the stripes don't look matchy here, because the sock on the right got nudged down just a bit more than the one on the left, but honestly this trick does work very well. Assuming you can spare a few yards of yarn to scrap and still have socks that are long enough. 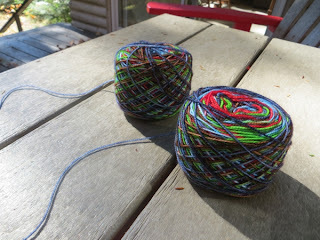 Another factor is how consistent the dyeing is - I have the greatest success with Knitterly Things' Vesper Sock, myself. Choose the first colour both cakes have in common. In this case, the winner is dark blue. 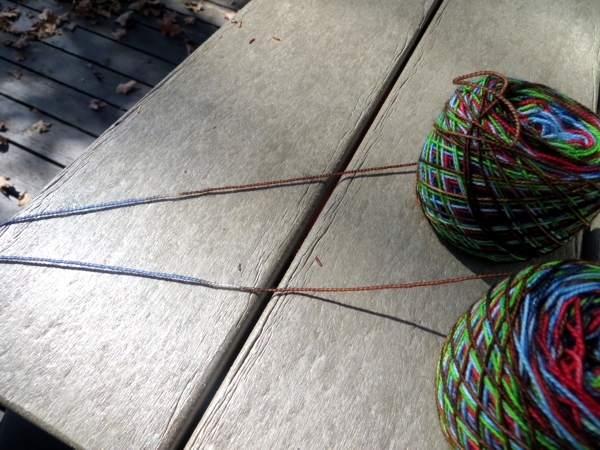 Now, move up the yarn to the shift between the first colour in common, and the one that comes afterward. I use a longtail cast on for this trick, and the key step is to ensure the first stitch for each sock (or glove) falls on the gap between those two colours. When you use the longtail cast on with striped yarn, especially at the break in colours, it's important to make sure you have the tail in front. Otherwise you end up with a weird colour shift. In this example it would be a brown edge, then a layer of blue, and then a cuff in brown. H'mmmm. That would look pretty cool too, but if you're going for matchy you'd have to remember to do it twice. 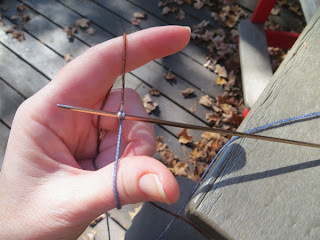 I cast on two or so stitches more than I need for the first needle, then slip those extras on to a second needle and cast on a total of two or so more than I need for it, and so on until I have four needles each with the right amount of stitches. It makes the counting go a lot quicker and the tension stays even on the cast on edge, too. When all the stitches are cast on, I usually work the first round plus one needle's worth of ribbing, just to be sure everything is secure before I pack it away for travel knitting. Then I draw off about 10" from the tail - that's the most you'll need later for running in the end - and snip off the excess for tying up parcels or darning a hole. And... you're done! 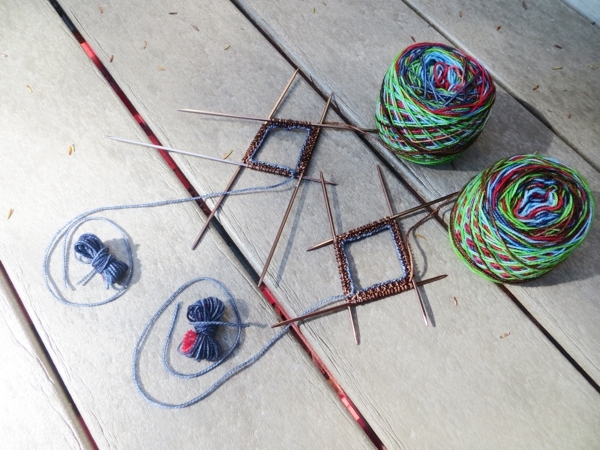 Except for all that delicious* knitting, of course.